Beautiful new construction in Cuscowillaâ€™s Lake Village Estates. This spacious 4 BR / 4.5 BA custom ranch home has a wide open floor plan, 2 car garage & golf cart garage. The kitchen is open into the living room with a huge vaulted ceiling and its loaded with granite counter tops, stainless steel Kitchen Aid appliances, subway tile back splash and elegant pendant lighting. The stacked stone fireplace and beamed ceiling are accentuated by the beautiful vaulted porch overlooking the 9th hole of the golf course. Each suite offers custom tiled baths, granite counter tops and custom closet shelving systems. The laundry /mud room off the garage has custom cubbies for golf clubs and shoes. 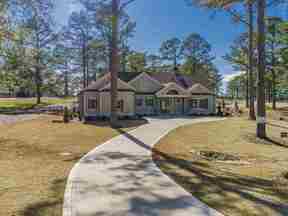 This home offers golf and Lake views plus its located directly across the street from the swimming pool and boat docks. A Full Cuscowilla Residential Golf Membership (no upgrade fee required) and a 4- seater EZ-GO Golf Cart are included in the price.